A purely vain post. I've been playing tetris every day since... I can remember, its that much fun, good test of the brain, keeps some parts of me nimble. Still, even I was suprised when my score on the A-type mode rocketed way past 300,000 on 131 lines right through to the dizzy heights of 400,000. This is unprecedented for me. 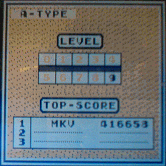 Game type: A, starting level: 9, no music. Top-Score: 1 MKV 416658. I am made of win.